villages, rugged mountains, still lakes, and the Atlantic coastline.  Coupled with this is a support infrastructure, competitively priced accommodation, crew access, Shannon International Airport is close by and Dublin less than 2hrs from the studios. Just one of the many benefits of filming in Limerick and the surrounding region is ease of access. Limerick is a central city with both global and national reach - so moving around in the area is never a problem. Welcome to Film in Limerick; the gateway to filmmaking here in beautiful Limerick and the surrounding region. Whether you’re sourcing locations, looking for cast and crew or want to know more about the tax benefits you can enjoy – we’re here to help and advise. Think of us as your go-to-place for the bigger picture of what amazing Limerick has to offer in the world of filming. Watch our promo video "Film in Limerick" to get a glimpse of some of the amazing locations Limerick has to offer. An Information Hub for All Things Film Through our range of services and facilities, having us at the end of the phone or online translates into substantial time- and money-savings for you. Important savings you can put back into quality film production. And whether your project is big or small, and whether you’re from Limerick or abroad – we’re made to fit. Full-Spectrum Services Access to information services and facilities – From convenient car hire to hotels that offers preferential rates to the film industry, let us put you in touch with what and whoever you need - including local authority, government agencies and local service providers. Information and Resources - We work in cooperation with The Irish Film Board to help filmmakers find locations, cast and crew, technical services and service providers. Full Resource Capability – To make sure you have the people, places and production assistance you need, we manage a full database of cast and crew as well as production resources and companies in our region. Production Library – We manage a growing directory of visual productions shot in Limerick, from short films to major feature films. Get in touch to have your production added to our directory. Link-up with media – we have a contact database for all local press and media, to help you get the word out. Whatever your query or need – let us handle it proactively, imaginatively and without delay. Saving you time, money and hassle. Filming on the Streets: While you do not necessarily need a permit to film on the streets of Limerick, it is in your interest to let us and the relevant local authorities know where and when you are filming, and to show courtesy to members of the public and local businesses. If you are filming on private property you will obviously need the owner’s permission. In the event of street closures, traffic control etc. you will need to apply for the appropriate permit or license. Film in Limerick do not issue permits and licenses for filming, but we can put you in contact with the right department in Limerick City & County Council to do so. See also: 'Working with the Garda'. Aerial/Drone Footage: From the 21st December, drone registration is mandatory in accordance with the Small Unmanned Aircraft (Drones) and Rockets Order S.I. 563 of 2015. All drones over 1kg must be registered. For information on the the rules and regulations for the usage of drones for aerial photography, please follow this link to the Irish Aviation Authority website: https://www.iaa.ie/general-aviation/drones Film in Limerick is here to help you with any questions about permits, or if you have a location in mind, but you are uncertain about permissions, please get in touch. We want to help your production run as smoothly as possible. From January 1st 2015, Ireland's tax incentive "Section 481" for film and television is enhanced, creating a new payable tax credit programme. Some benefits of Section 481 are: Increased rate of relief: The rate of tax relief has been significantly increased and is now worth up to 32% of eligible Irish expenditure. Expansion of eligible expenditure criteria: The payable tax credit is now based on the cost of ALL cast & crew working in Ireland, regardless of nationality. Greater flexibility in the application process: An application for a certificate entitling the applicant to the tax credit can be submitted at any time prior to the completion of the project. For more detailed information on the various tax and funding schemes Ireland has to offer visit the Irish Film Board website. When it comes to places to stay, Limerick offers a wealth of options – from the very best in 5-star hotels to comfortable, value-for-money B&B’s. Simply choose according to what’s convenient and works best with your timings and budget. Talk to us before you make your bookings and you can enjoy significant savings: we have a comprehensive list of hotels, guest houses and apartments that offer accommodation packages specifically for the film industry, when longer-term stays may be necessary. Flexible deals include weekly and monthly letting options as well as self-catering options – so be sure to give us a call to make sure you get exactly what you want. Alternatively you can view a full list of accommodation options available in Limerick and the surrounding area on Limerick.ie.